Welcome to Papers for Windows! Papers started as a Mac only application, and has now expanded to include Papers for iPhone and iPad, and now Papers for Windows. This guide is meant for you if you have never used Papers on Mac, and are completely new to Papers. However, if you have used Papers on a Mac you will benefit from this guide as well. The Papers for Windows user interface was designed to be true to the Windows environment, and will look and feel quite different for previous Papers users. The knowledge base is where you will find a growing body of tutorials to help you discover everything Papers can do for you. However, first we'll get started with the basics. Papers is your personal library of research. You can search different databases right from within Papers, and import articles you want directly into your library, where you can organize your PDFs into collections. You can also add articles to Papers by dragging and dropping them straight into the application. There are a few ways to import articles into Papers. If you have articles on your hard drive, you can simply select them and drag and drop them into the application. Papers will now import your articles to your library. You can personalize the way your library is organized and how your PDF articles are named. By default Papers will rename your articles, based on the parameters you set. You can read more about this in this knowledge base article. 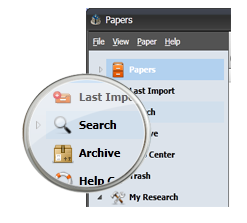 You can perform your literature searches right from within Papers. The benefit of doing this is that Papers will import any metadata available for your articles right away when you import them from your search. You can also switch easily and quickly between repositories to widen your search, without ever leaving the application. To start a search, click on "Search" from the source list, and select the database you would like to use. Papers automatically tries to match your articles to metadata. This is useful when searching your library, but having good metadata is indispensable for magic manuscripts. Using magic manuscripts you can insert citations while you write. When you are finished writing, magic manuscripts to insert a bibliography and format your document using the citation style you prefer. If you need to change the citation style later, you can do this with a few clicks. Papers Livfe is a revolutionary new way to collaborate with peers and share information. With Papers Livfe you can share collections (Livfe collections) with any other Papers user (whether Mac or Windows). Livfe collections can be public (for anyone to see and access), or private (only visible to those you invite). With private collections you can share a collection of articles for a paper you are collaborating on with a colleague across the hall, or across the world. You can also use Livfe to set up a journal club. Before you can start using Livfe, you have to activate it from the options menu. You can create Livfe collections just as you create any other collection. 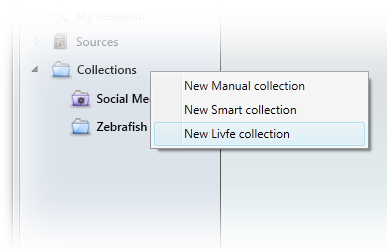 Right click on collections in the source list, or select New Collection from the file menu.